»Thermal power is the "largest" source of power in India. There are different types of Thermal power plants based on the fuel used to generate the steam such as coal, gas, and Diesel. About 71% of electricity consumed in India are generated by thermal power plants. »Thermal power plants convert energy rich fuels such as coal, natural gas, petroleum products, agricultural waste, domestic trash/waste, etc. into electricity. Other sources of fuel include landfill gas and biogas. In some plants, renewal fuels such as biogas are co-fired with coal. » Here is the list of major Thermal Power Stations in India. When electricity was introduced in India? The first demonstration of electric light in Calcutta was conducted on 24 July 1879 by P W Fleury & Co. On 7 January 1897, Kilburn & Co secured the Calcutta electric lighting licence as agents of the Indian Electric Co, which was registered in London on 15 January 1897. A month later, the company was renamed the Calcutta Electric Supply Corporation. The control of the company was transferred from London to Calcutta only in 1970. Enthused by the success of electricity in Calcutta, power was thereafter introduced in Bombay. Mumbai saw electric lighting demonstration for the first time in 1882 at Crawford Market and Bombay Electric Supply & Tramways Company (BEST) set up a generating station in 1905 to provide electricity for the tramway. The first hydroelectric installation in India was installed near a tea estate at Sidrapong for the Darjeeling Municipality in 1897. The first electric street light in Asia was lit on 5 August 1905 in Bangalore. The first electric train ran between Bombay's Victoria Terminus and Kurla along the Harbour Line, in 1925. 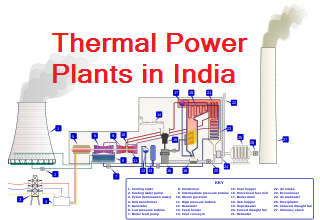 A thermal power station is a power plant in which heat energy is converted to electric power. In most of the world the prime mover is steam driven. Water is heated, turns into steam and spins a steam turbine which drives an electrical generator. Which type of coal is used in thermal power plants? Generally coal is used as a major fuel in mostly all the thermal power plants because it's the most abundant fossil fuel, easily available at relatively low cost. For electric power generation; lignite coal is generally used. Bituminous coal is also used sometimes depending upon the availability. Which is India's biggest thermal power plant?